On October 11, 2016, Frederick Clement Westphal Jr passed away in his native Louisiana at the age of 104. From 1965 to 1971, Westphal was the chairman of Esso Standard Oil HK (now ExxonMobil HK) and presided over the establishment of Peninsula Electric Power (PEPCO), Esso’s power generation joint venture with China Light & Power (CLP) and the construction of its power stations in Hok Un and Tsing Yi Island. PEPCO was one of the biggest American investments in post-War Asia and was critical in helping CLP meet the soaring energy demand of Hong Kong as the economy took off in the 1960s and 1970s. During his time in Hong Kong, Westphal was also involved in the establishment of the American Chamber of Commerce (Amcham) in 1969 and served as its second chairman in 1970. The Exxon-CLP partnership which began with Westphal eventually expanded into three joint ventures over time and lasted for almost half a century. Along the way, it helped Hong Kong to emerge as a global metropolis and elevated the status of American business in the HK economy. Born on December 18, 1911 in New Orleans, Fred Westphal studied accounting at Tulane University and began his career with the statistical section of the Southern marketing division of Shell Oil in New Orleans in 1937. He joined Esso (aka Standard Oil of New Jersey) in Baton Rouge in 1940 and soon became its assistant head of data processing. After the War was over, he returned to Esso in Baton Rouge as head of the data processing department in February 1946 and oversaw its 3700 employees. During the next decade he served as a number of department heads in Baton Rouge before transferring to New Jersey where he was in charge of the firm’s refinery in Bayonne from December 1959 to December 1962, during which he was appointed chairman of the Bayonne Industrial Commission by the mayor. Across the Pacific Ocean, the 1962 reorganization of Standard Vacuum (Stanvac) which was formerly jointly owned by Esso and Socony Mobil had resulted in Esso being cut out of the HK market as Mobil assumed control of all of Stanvac’s HK business. 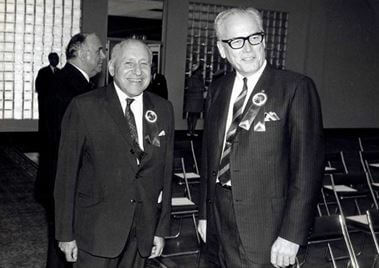 [iii] An opportunity for Esso to re-enter the HK market came when CLP chairman Lawrence Kadoorie visited Michael Haider, then chairman of Esso in New York in 1964 through the introduction of George Bell, a retired Standard Oil China executive. By the early 1960s, the unprecedented growth in post-War Hong Kong industries was driving up the demand for electricity by 20 percent per year, testing the power generation capacity of CLP which was also threatened by proposals of nationalization. Over half a billion HK dollars in capital was required to upgrade the power grid to meet the demand and while Kadoorie had the option of bank financing, his preference was for an equity partner. At the time CLP accounted for 40 percent of oil imports in HK and in a daring move considering the geopolitical situation at the time, Haider agreed to put up capital for a new power plant in exchange for the oil supply contract, making it the first and only utility venture for the oil giant in the world. After several months of quiet negotiations in two continents (which were kept secret from CLP’s then primary oil supplier Shell) and with the blessing of HK Finance Secretary Sir John Cowperthwaite (who much preferred this private market solution than the government stepping in to take over CLP) and the US government (who had been restrictive of American firms doing business in the colony during that period of Cold War due to concerns about benefiting neighboring Communist China), the joint venture – PEPCO – was announced and approved at the CLP shareholder meeting in November 1964 and formally incorporated in December 31, 1964 with authorized capital of HK$400 million with Eastern Energy Co Ltd, a subsidiary of Esso Standard Eastern (Esso’s Asia arm) holding 60% and CLP holding 40%. In the setup, CLP served as the exclusive distributor of electricity generated by PEPCO and Esso served as the exclusive oil supplier to PEPCO for 20 years. Armed with a 30 page green book prepared by the two colleagues who had concluded the JV deal, Westphal charged ahead with building the power plants in the next couple of years, unfazed by the banking crisis in 1965 and the riots in 1966 and 1967. 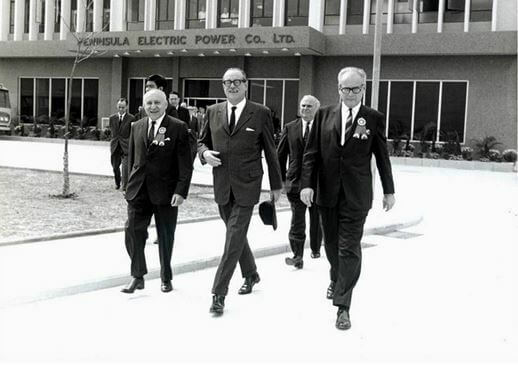 The new power station for phase I of PEP – known as Hok Un C station opened within months of his arrival in October 1966 with all installations completed by January 1968. As for Phase II, a site on Tsing Yi island was identified as it had abundant cooling water, was well suited for construction of tanker facilities and was relatively cheap. On January 1966, PEPCO acquired the 3.4 million square feet site and the construction involved cutting more than 5 million cubic yards from the hillside and reclaiming about 2.2 million square feet from the sea together with building a sea wall 3600 feet long. In 1968, Westphal was elected president of the American Club and despite physical difficulties due to spinal injuries, he presided over the club’s relocation to St George’s Building, a property controlled by his JV partner the Kadoories. By 1968, the US had already overtaken the UK as the number 1 trading partner of HK, representing 14 percent of all imports. There were around 5000 Americans living in HK and 400 American companies (up from 50 at the end of the Korean War in 1954) including 160 manufacturers that employed 50000 workers (or 15% of all manufacturing jobs in HK at the time). During their stay in Hong Kong, the Westphal family which included his wife Pauline Blevins (“Polly”) and their teenage children (two daughters and one son) lived in a house on 36 Repulse Bay Road rented from the Aw family of Tiger Balm fame. In addition to Amcham and American Club, Westphal was also part of a social group of expatriate men known as Alcoholics Synonymous who met every Saturday at the FCC. The group was headed by the Australian reporter Richard Hughes (1906-84, author of Hong Kong: Borrowed Place, Borrowed Time) and members included a diverse group of characters ranging from Westphal’s fellow New Orleans native Randy Feltus (one of the founding fathers of the PR industry in Asia), journalists who were stationed in HK to cover the Vietnam War, CIA agents and a Kowloon bartender. In the following decades, HK’s electricity demand continued to rise and two more joint ventures with the same 60/40 shareholding split between Exxon and CLP – Kowloon Electricity Supply Co (KESCO) and Castle Peak Power Co (CAPCO) were formed in 1978 and 1981 under the leadership of Westphal’s successors C. Howard Duncan and Roy W. Smith to operate additional power plants in Castle Peak (opened in 1982, 4108 MW), Penny’s Bay (opened in 1992, 300 MW) and Black Point (opened in 1996, 2500 MW). With the additions of these significantly larger power plants CAPCO, PEPCO and KESCO were dissolved in 1996 and the Hok Un and Tsing Yi power station were demolished in 1991 and 1998 respectively. In 2013, ExxonMobil decided to sell its 60 percent stake in CAPCO to CLP and China Southern Grid (each taking 30 percent) for HK$24 billion [x], ending almost half a century of transformative partnership. Back home, Westphal enjoyed decades of retirement in his native Louisiana where he was active with nonprofit groups such as the Rotary and remained alert until the very end. He last visited Hong Kong in 2004 at the age of 93, very impressed with the economic development and the growth of Amcham which by then had over 2000 members (up from 128 when he was chairman in 1970). Amazing tribute! Thank you for taking the time and effort to honor my beloved grandfather. The American Chamber of Commerce Hong Kong is building plans for a celebration of our 50th anniversary in early 2019. Our theme will be celebrating the past 50 and looking forward to the next 50 years of engagement. Importantly, we are gathering important photos and memorabilia from the past 50 years, as well as chronicling the Chamber’s history. In my research, I came across this lovely tribute to your grandfather who was a key figure in the early history of the Chamber. I hope you don’t mind me contacting you here. I am searching for photographs of the Chamber’s early years, and important moments in US-HK history, and I am wondering if I could contact you to discuss? If you are willing, please reply to me here and we can find a way to connect without posting our contact details publicly online. I would love to hear from you. Thank you! Hi Nancy, thanks for reaching out – i would love to help out in any way that i can! i am not sure how different our time zones are but you can try to contact me via Email laurakaitlin.lks@gmail.com or my cell phone (225) 245-2776 whenever is convenient.